March 2, 2017 - Ontario’s forest industry faces many challenges, from climate change, to trade agreements to public perceptions. Those challenges were discussed at length at the Ontario Forest Industries Association’s 74th Annual Meeting held in Toronto yesterday. But despite these challenges, the mood was bright at the meeting, likely due to the variety of speakers who gave encouraging ideas for companies to adapt and grow. Kathryn McGarry, Ontario’s Minister of Natural Resources and Forestry, was the first speaker of the day and shared the latest provincial stats. 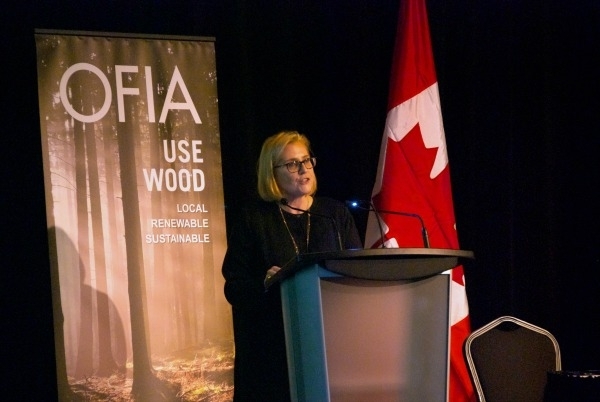 Ontario’s forest industry is responsible for $15.5 billion in economic activity and employs 172,000 people in 260 communities through direct and indirect jobs, she said. McGarry said she continues to advocate for a federal loan guarantee program for softwood producers, indicating that Quebec is on board but other provinces are not. “This is a national issue. We need a national solution,” she said. With a provincial election likely happening next year, Ontario’s other political parties also addressed the audience, including Progressive Conservative Leader Patrick Brown and NDP MPP for Timmins-James Bay Gilles Bisson. All politicians echoed their support for the industry. Structurlam President Bill Downing was the keynote future of forestry speaker. He discussed the evolution of mass timber construction projects in Canada, the most noteworthy of which is the UBC Brock Commons building in Vancouver. The 18-storey wood building is the tallest in the world, standing 53 metres tall. The structure was built in 66 days using 1,302 Glulam columns and 464 cross-laminated timber (CLT) panels, manufactured by Structurlam. Mass timber is not all rosy though, Downing cautioned the audience. The mass timber manufacturer is challenged by the high cost of wood, which must be cut to specification by sawmills, and the often sluggish process to get a mass-timber building approved for construction. “We’ve got a long way to go,” he said. Next up was a panel on climate change in forestry. Moderated by MNRF deputy minister Kathleen McFadden, the panel included FPAC CEO Derek Nighbor, EcoView Consulting’s Steve Colombo, and Natural Resources Canada senior researcher Werner Kurz. Panellists dove into questions about ineffective government policies, unfair public perceptions, and the realities of the changing climate on foresters. Kurz reinforced the importance of the industry working with scientists to support evidence-based decision making, which results in facts that can be shared with the public. There is also a big opportunity for the industry in biomass, Nighbor said. FPAC, he said, is focused on the creation of smart policy that allows forest product companies to enter the biomaterials market. More than one speaker addressed their efforts to educate the public on the climate benefits of wood products, and correct misinformation about Canada’s world-class sustainable forest management practices. Rob Keen, CEO of Forests Ontario, detailed the organization’s It Takes a Forest campaign that is changing the conversation from “protecting” Ontario’s forests to “sustainably managing” them. The campaign uses graphic billboards and posters to share fact-based information about forestry. Sustainable Forestry Initiative President and CEO Kathy Abusow updated the audience on SFI’s certification numbers, which has soared to more than 150 million hectares in Canada and the U.S.
Jason Koivisto with Ontario Wood introduced the newest campaign material, which promotes the quality of Ontario wood products. And a group of Ontario and Quebec mayors signed a historic Boreal Forest Alliance agreement that aims to unite lobbying efforts to support the forest industry in their communities.